Jackie Dufresne, right, beats Orchard Park’s Sydney Potenza to the ball in their game on Tuesday at Frontier. Sterling Taplin of Williamsville North, a three-time first-team All-Western New York selection and the winner of the Allen Wilson Award as the WNY Player of the Year, will attend St. Thomas More Prep next year he said Tuesday. Among the many athletes who have attended the Oakdale, Conn., institution for post-graduate schooling is former Buffalo Braves star Ernie DiGregorio before he went to Providence College. Former Canisius College coach Nick Macarchuk was the coach there when DiGregorio played. Taplin had a scholarship offer from Siena he told The News earlier this month, but added that he was considering attending prep school for a year. The Bishop Timon-St. Jude lacrosse team has lost three games to nationally ranked out-of-state teams so far and is unbeaten against New York State competition. Tuesday, the Tigers had little trouble against Nichols, rolling to an 18-0 halftime lead and defeating the Vikings, 19-1, at Pierce Field for their third straight Monsignor Martin Association victory. Connor Fields scored six goals and had two assists for Timon. Adam Dimillo added five goals and three assists. Timon’s losses have come to No. 1 ranked Boys Latin of Baltimore, No. 2 Culver (Ind.) Military Academy and No. 6 Hill Academy of Ontario. Next up is a Thursday game at St. Joe’s. 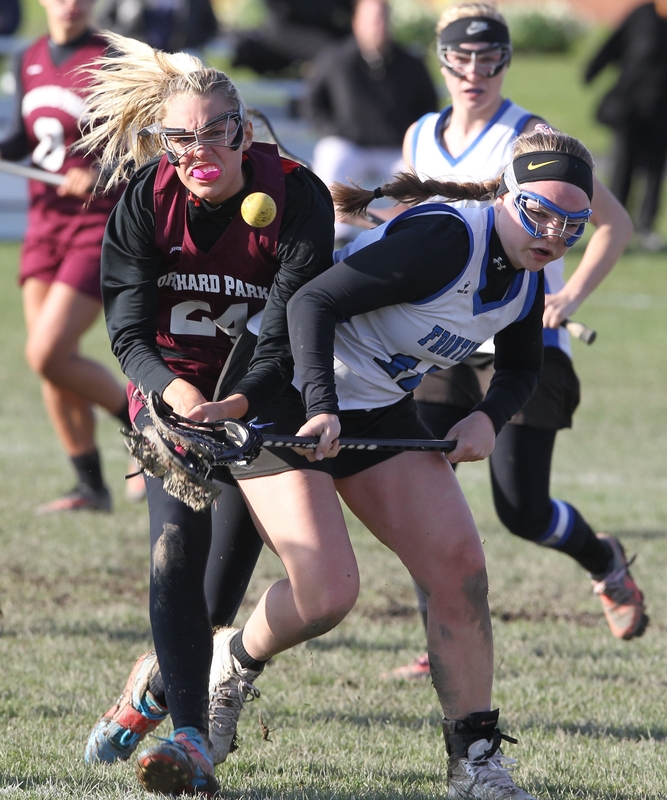 Hannah Lease, a returning All-Western New York selection, scored four goals and sophomore Alexis Rockey had three tallies for Frontier (5-2, 4-1) in a 12-8 girls lacrosse victory against visiting Orchard Park Tuesday in Section VI Division I play. The Falcons have lost only to No. 1 Lancaster and No. 2 Hamburg. Williamsville East stretched its winning streak to four with a 13-7 triumph at Iroquois. Grace Curatolo scored four times and assisted on another for the Flames. The Flames will take on crosstown rival Williamsville South at home on Thursday. Marissa Gosdeck won the 200 and set an Alden record with a leap of 36 feet, 5 inches in the triple jump in a 91-50 ECIC IV girls dual meet victory at Depew. Gosdeck’s effort topped her listed best of 33-6 and is the third best in Western New York this season. Gosdeck erased the Alden record of 35-5.5 set in 2012 by Alyssa Handley.